Imagine completing your Kailash Mansarovar Yatra in just 11 days – without any physical hardship and in the swiftest possible manner. It’s possible with Comfortmytravel. A passionate devotee of Lord Shiva with a profound desire to catch sight of and pay tribute at Mount Kailash and Kailash Manasarovar, yet, unaccomplished because of the absence of time can be finished at this point. Kailash Mansarovar Yatra by helicopter makes your long pending wish of visiting Kailash Mansarovar simple and easy and you can complete it in an easier way. No need to take the treacherous road route choked with traffic. Comfortmytravel has tailor-made this itinerary for small private groups who, for health issues cannot take the arduous journey but still want to go on this pilgrimage, at least once in their lifetime. Arrive at Kathmandu Airport our staff will welcome you then transfer to hotel after lunch we will proceed to Pashupatinath, Laxmi Narayan and other temples darshan (Hotel Shanrigla / Marriott). Early Morning drives to Nepalganj airport and catch the flight for Simikot, rest for few hours at Simikot and then fly to Hilsa by Helicopter. Wait for other group travelers to reach there and drive to Purang. Overnight stay at Hotel Purang. Its 40-50 minutes flight from Nepalganj to Simikot & then 10-20 minutes helicopter flight from Simikot to Hilsa. 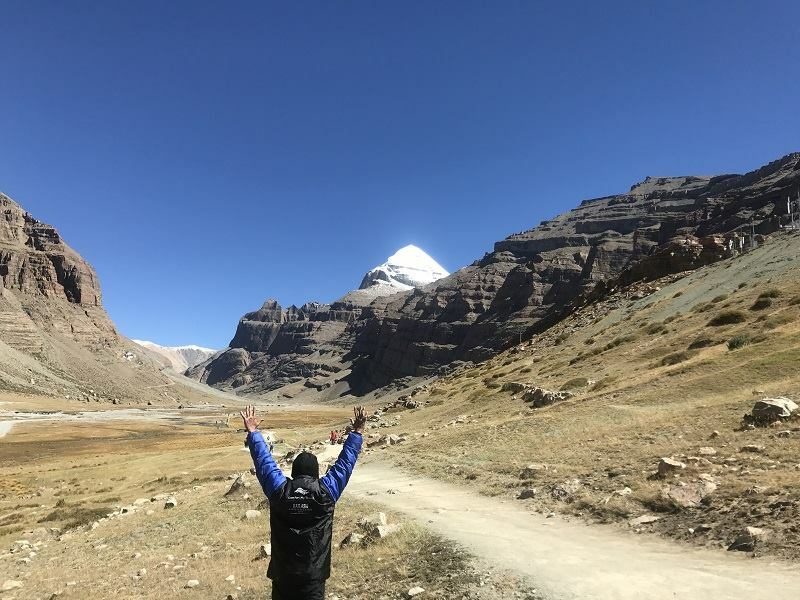 Entire day free for acclimatization and short trek may be taken in preparation for Mount Kailash Parikrama. Overnight stay at Hotel Purang. Purang is a small & very clean town with lots of shops on both sides of the road for shopping necessary items for further Yatra. You can buy trekking sticks, water gallon for keeping Holy Mansarovar Water, some packed juices & other things. Some bargaining happens here at almost all shops. Its pleasant experience to roam around at Purang. After breakfast drive for roughly 2 hours in AC Volvo category bus to Mansarovar Lake and then Parikrama of Mansarovar Lake. Complete Holy Lake Parikrama of approx. 105 KMs by bus, take holy bath and perform Puja at divine Lake Mansarovar. While coming to Mansarovar Lake you will see the Mount Kailash for the first time. It's an overwhelming experience to see Divine Mount Kailash, just next to Holy Lake Mansarovar while taking bath. Overnight stay at Guest House near Lake Mansarovar. If weather permits, You can visit Lake Mansarovar in the night or early morning (Brahm Muhurt) too to witness the divinity of the place. After the short drive from Lake Mansarovar, you will reach to Darchen which is base for Kailash Parikrama & Ashtapad darshan. Will visit Asthapad if get permission from Chinese authorities. Early in the morning after breakfast, we will drive to Yamdwar and then trek to Dirapuk ( 10 KMS first day Parikrama). You get blessed with the darshan of North Face of Mount Kailash during the first day of Parikrama which is considered to be most auspicious. Those who are not doing Parikrama will travel from Yamdwar to Darchen for approx. 30 minutes and stay there in Guest House for 2 nights. You can see & pray to Mount Kailash from Darchen. **Parikrama is optional. There are few who would be doing Parikrama by walk, few by horse & few old age people may not be doing Parikrama. Those who are not doing Parikrama will return from Yam Dwar to Guest House at Darchen. We will arrange meals & accommodation there. Holy Mount Kailash is easily visible from there & one can do puja from there too. People staying at Darchen will join other group members in 1st half once they complete 3rd day of Parikrama. Early morning start trek from Dirapuk to Dolma La Pass and then Zuthulpuk. Total trek is of 22 KMs on the second day of Parikrama. This is the most difficult part of the journey in throughout the yatra since you have to trek up to the 18,600 ft height above sea level. From Doma La Pass descend to Gauri Kund and further trek along with the river to Zuthulpuk. Overnight stay – Lodge / Guest House. First 6-7 KM (till Dolma La Pass at 5600 m) of the 2nd day has very steep climb & most difficult part of Yatra. Yatris are advised to take comfortable time to cover it & take rest wherever you feel the problem. After 1st 6-7 KM, remaining 16 KMs are comparatively plain / downwards & comfortable. Important: Parikrama (Day 2). You will pass through Shivasthal (Sacred place for Tibetans & believed that whatever you offer here, get it in Heaven) & Gauri Kund. After Dolma La Pass its long pleasant trekking way beside the river. You will see East face of Mount Kailash here. Third day, the Parikrama is of 8 KMs & takes around 3 hours to complete. Generally, it gets completed by 9:00 to 10:00 am. After this short trek, drive to Darchen and continue drive to Purang. Overnight stay at Guest House. Drive to Hilsa by AC luxury vehicle, fly back to Simikot by Helicopter then to Nepalgunj by flight & then fly to Kathmandu. Overnight stay at 4 Star Hotel (Hotel Shankar / Hotel Royal Singi or similar). After breakfast, you are free to proceed to your home destination with blessings of Lord Shiva!! 3. Guide and Medical Support: throughout the yatra. 4. Medical: First Aid Kit, Oxygen Cylinders, Oxygen & Blood pressure measuring devices. 5. Yatra Completion Certificate for Subsidy. 6. 1 Duffel bag, 1 Backpack, and 1 Jacket. 7. Travel Insurance of 50000 USD. 1. Pony/Porter/Yak etc. for Parikrama (During circumambulate of Mount Kailash). 2. Personal nature expenses such as Phone/Tips/Drinks/Shopping/Laundry etc. 3. Additional cost of Accommodation & Transport on early return due to personal/ or natural problem. 4. Nepal Re entry Visa fee for NRI. 5. Extra night stays at any location. 7. Any other additional pay if charged by Chinese authorities due to changing in the rule. 9. Any other expenses which are not mentioned above. Kailash Mansarovar Yatra by Helicopter Ex Kathmandu 2019. Tour starts from 21st April 2019. Kathmandu, Muktinath, pashupatinath, Ayodhya, Naimisharan and Lucknow local sight seen.